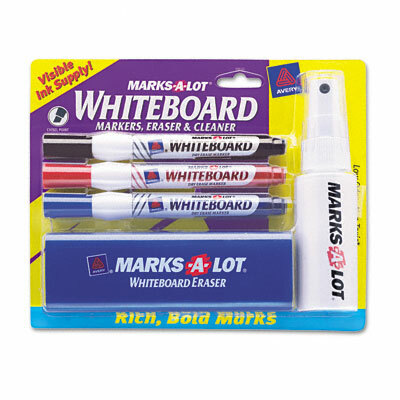 Kit features three broad chisel tip markers (black, red and blue) for whiteboards, glass and other nonporous surfaces. Unique slim, easy-to-grip barrel designed specifically for marking on vertical surfaces. Low-odor and nontoxic; ACMI certified (conforms to ASTM D 4236). Also includes a 2 ounce bottle of whiteboard cleaner and a whiteboard eraser. Get it together with this comprehensive kit. Features three broad chisel tip markers (black, red and blue) for whiteboards, glass and other nonporous surfaces. Unique slim, easy-to-grip barrel designed specifically for marking on vertical surfaces. Low-odor and nontoxic; ACMI certified (conforms to ASTM D 4236). Also includes a 2 ounce bottle of whiteboard cleaner and a whiteboard eraser.